This lithium-ion polymer battery is designed for use with the WeDo 2.0 Smarthub, provides longer run time than AA batteries, and requires a charge time of approximately three hours. Get things moving with the Medium Motor. 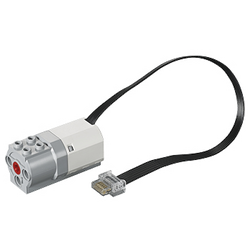 This medium-size, medium-power motor has 2x2 studs on the top and a snap interface on the front to allow easy and optimized integration with the WeDo Core Set elements. No setup is required. Simply connect the Medium Motor to the Smarthub for automatic identification by the WeDo 2.0 Software. Attach the Tilt Sensor to the WeDo 2.0 Smarthub and it can detect seven different types of orientation: Tilt This Way, Tilt That Way, Tilt Up, Tilt Down, No Tilt, Any Tilt, and Shake. 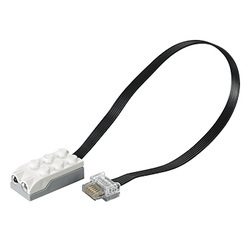 No setup is required; simply connect the Tilt Sensor and it will be identified automatically by the WeDo 2.0 Software.